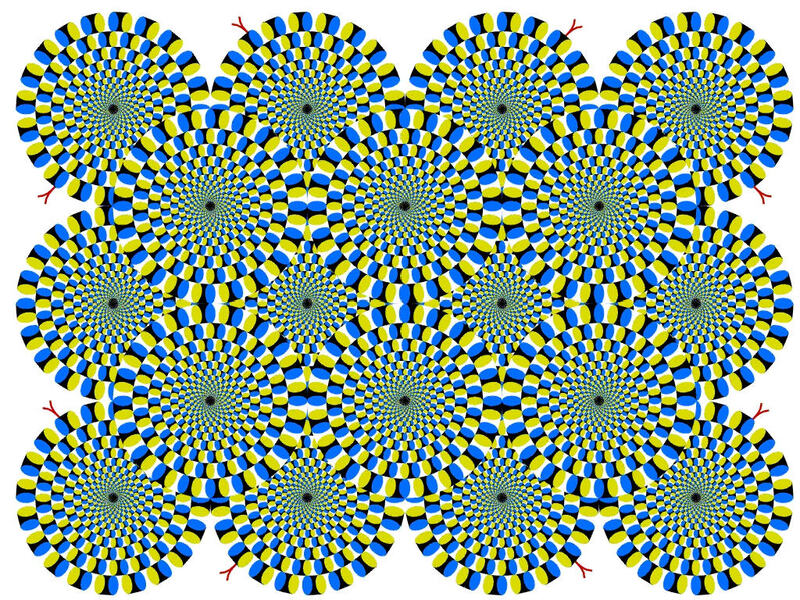 The circles appear to move, but are actually stationary. Focus on any of the small black circles (in the center) and the motion stops! 1.30: Nine kinds of distractions come that are obstacles encountered on the path, and are physical illness, tendency of the mind to not work efficiently, doubt or indecision, lack of attention to pursuing the means of samadhi, laziness in mind and body, failure to regulate the desire for worldly objects, incorrect assumptions or thinking, failing to attain stages of the practice, and instability in maintaining a level of practice once attained. 1.31: From these obstacles, there are four other consequences that also arise, and these are: 1) mental or physical pain, 2) sadness or dejection, 3) restlessness, shakiness, or anxiety, and 4) irregularities in the exhalation and inhalation of breath. 1.32: To prevent or deal with these nine obstacle and their four consequences, the recommendation is to make the mind one-pointed, training it how to focus on a single principle or object.